I am a product of the self-esteem movement. Thank goodness my parents didn’t buy into the idea wholeheartedly. Children born in the 70’s and 80’s were raised based on the idea that building self-esteem is a critical component to raising well-adjusted children. There was a belief among parents that self-esteem was an extrinsic quality and needed to be fostered by parents themselves. Kids were spoon-fed lies like, “You can be anything,” and “You can do it all.” Why were they told this? Because their parents bought the lie too, that building a child’s self-esteem is critical to raising an emotional healthy child. Problem is, it’s not. In fact, the Gospel of Self-Esteem is dangerous. In the wake of liberalism and political correctness, more and more parents are latching on to the notion of self-esteem. It has now expanded into schools and children’s sports, as well. In Ottawa, Canada a rule has been established by the local soccer league stating that a team cannot win by more than 5 goals. That’s right. If they score a sixth goal, they lose. In an attempt to make the losing children feel better about the fact that they lost, they have created “a non-competitive environment.” Swell, sounds like fun. Why bother playing? Those who grew up swimming in the sea of the self-esteem movement were slapped in the face when the reality hit that not everyone is going to give you accolades or pats on the back. They very quickly realized that you don’t necessarily deserve praise just for showing up. You earn a reward when you perform well. Your boss will not always throw you a “Job well done, Captain,” or an “Atta boy.” People expect responsibility and performance from adults. Go figure. There are certain things expected of us in life and there are other things for which we must strive. Confusing the two creates children—and then adults—who are underachievers and yet “over-expecters”. They have accomplished little, yet expect to receive the same kind of reward and recognition as those who have done much. I am certainly still figuring out the balance between praising my children and giving them unnecessary compliments. I am attempting to let the Lord lead me in this area as I listen for his instruction. One thing the Lord has showed me is that children, do not in fact, gain self-esteem because someone lavished verbal praise upon them. Rather, self-esteem and self-efficacy develop from discipline, healthy boundaries, and in knowing the person of Jesus. God says we are valuable and worthwhile. He says we are treasured and can be adopted into His family through Christ. Are you a proponent or opponent of the self-esteem movement? How, if at all, has God encouraged your “self-esteem”? What is a good way to encourage and motivate others others? Even though this blog entry is over a year old, I see that no one has commented on it yet, so I’ll do the honors. I’m mixed about self-esteem. I always thought it meant, “Not beating yourself up or thinking that you’re a piece of sh*t.” At least when people tell me about my self-esteem problem, that’s usually what they mean. But I have a feeling that’s not what you’re referring to. 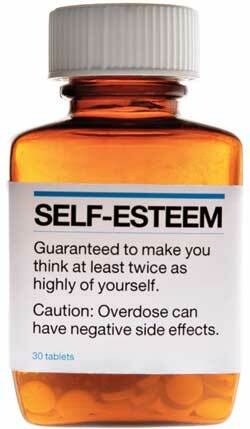 In this case, it seems like this sort of self-esteem is the self-help crap you see on Oprah. If that’s so, then I’m with ya on that one! I think not beating yourself up or thinking you’re a piece of “s” is more about self-worth. That’s how I would define it. For example, I don’t find my self-esteem in Jesus Christ–I find my self-worth in Jesus Christ. Self-esteem is placing emphasis on one’s abilities, talents, brains, etc. Whereas self-worth is finding worth in yourself from a greater source and in my case it’s the Lord. And yeah, that crap on Oprah kills me! P.S. thanks for being the first to comment. The post isn’t actually that old, but I moved it over from my Tumblr, thus losing the comments it had. I have a bunch of posts on there still that I need to bring over. I’ll probably re-post this one next week so more people can see it. “What is a good way to encourage and motivate others others?” This sentence caught my eye for some reason… well, anyway, after years of experience and working with other people I think that the best way to encourage others is to recognize them as they want to be recognized, and support them in ways they want to be supported in as opposed to ways you want them to be supported. I watched this old movie “Bowling for Columbine” about arms laws in the U.S, and they director asked a famous singer “What would you say to the kids who did the massacre in the columbine high school if they were still alive?” and the singer replied with: “Nothing, I would say nothing. I would just sit there and listen to what THEY have to say, which is something that no one else did”. I’m not religious and yet I agree fully. I just got my psych degree last year and I couldn’t believe the level of preposterous nonsense that became popular and somehow made its way into a supposedly academic study of personality, from “The Secret” to “You can achieve anything”. And “Be yourself” is probably the best example of the kind of nonsense I’m talking about. It’s not a suggestion, it’s not even a proposition, it’s just bull. How can anyone be anything other than themselves? And if they are trying to imitate someone else, aren’t they imitating because they WANT to be someone else? How would the person advising to “be yourself” know what YOU are anyway? And yet its own vapidness explains why it’s so popular: If you made a mistake or an error in judgement, you were not “being yourself”. Well, no, some of us are actually jerks by nature, so some of us shouldn’t be ourselves. Wow, we seem like kindred spirits on this subject. I couldn’t agree more with all that you wrote. Did you happen to read my “DON’T Be Yourself” post? Because it you didn’t and you wrote all of this, then you and I really do think alike on this subject. Thanks for stopping by and commenting here too. Blessings. Next Next post: What Makes a Man Worthy of Marriage?